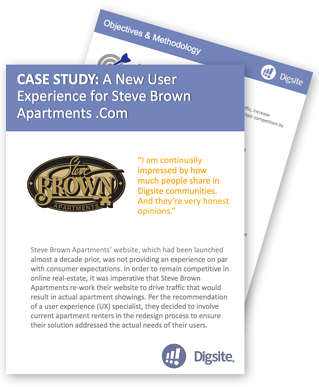 Steve Brown Apartments’ website, which had been launched almost a decade prior, was not providing an experience that was on par with today's consumer expectations. They wanted to redesign their website to provide a user experience that was worthwhile to their consumers. So, they decided to involve current apartment renters in the redesign process to ensure their solution addressed the actual needs of their users. Steve Brown Apartments needed to present new design concepts to users, receive real-time feedback for their design team and iterate to hone in on the optimal solution. With their busy season quickly approaching, they needed insights fast. So, they turned to a Digsite Sprint.